REGISTER FOR GREAT GIVEAWAYS SPONSORED BY OUR MEMBERS! PLEASE CONTACT LISA KINDLER at lkindler@ovoga.org for more info. THIS IS A FREE EVENT FOR MEMBERS/MEMBER GUESTS ONLY. CORPORATE SPONSORSHIPS AVAILABLE -- PLEASE CONTACT LISA KINDLER at lkindler@ovoga.org for more info. Two free tickets are available for each member. Additional tickets may be purchased. Dr. Charles Zelek is a senior economist with the DOE Office of Fossil Energy (FE). In this capacity, he conducts energy market analyses to inform FE’s fossil energy research, development, and demonstration programs and contribute to related policy and regulatory decision making. Dr. Zelek has worked in the field of energy economics for over 20 years across positions in academia and government. He has conducted research on terrestrial carbon sequestration internationally in the Philippines, supported formulation of the Energy Title of the 2008 Farm Bill as a Senior Economist for the Department of Agriculture, and evaluated the impacts of advanced energy technologies at the Department of Energy. Currently Dr. Zelek’s research focuses on the energy-water-food nexus. Most recently Dr Zelek has been designated by the Assistant Secretary of Energy to be the DOE contact to the Tri State Governors Shale Coalition. NETL’s oil & gas programs conduct research to improve the production, processing, transportation and storage of oil and natural gas resources. The Laboratory’s research portfolio advances technologies to improve hydrocarbon recovery efficiency, reduce the operational risks of production, improve the performance of pipeline infrastructure, and characterize resources in emerging basins and plays. Bill Johnson was born and raised on family farms, where he learned early the values of hard work, honesty, and sacrifice. Johnson entered the U.S. Air Force in 1973, and retired as a Lieutenant Colonel after a distinguished military career of more than 26 years. In 2010, Johnson was elected to his first term to represent the people of Ohio’s 6th Congressional District, which covers much of eastern and southeastern Ohio. In November of 2018, he was elected to his 5th term. He currently serves on the House Energy and Commerce Committee and the House Budget Committee. Additionally, he is the Co-Chairman of the House Natural Gas Caucus and a member of the House Shale Caucus. Johnson is also the author of the book entitled "Raising Fathers", in which he addresses the importance of fatherhood, and begins confronting the destructive social and cultural impacts caused by the staggering number of America's children that are being raised in fatherless homes. Bill and his wife LeeAnn, currently reside in Marietta with a son, Nathan. He is also the proud parent of three grown children and is a grandfather of six. CORPORATE SPONSORSHIP for this event is available for MEMBERS ONLY!! DEADLINE for sponsorship is FRIDAY March 1, 2019. Additional tickets will be sold for $30.00. To RSVP, for additional tickets or to hold your spot as a sponsor, please contact Lisa Kindler at lkindler@ovoga.org or call 740-232-9219. The Ohio Valley Oil and Gas Association's January Dinner Discussion will feature Greg Kozera, Director of Marketing and Sales for Shale Crescent USA and will be held on Wednesday, January 30, 2019 at the Belmont Hills Country Club in St. Clairsville, Ohio. The mission of Shale Crescent USA is to generate a global awareness of our region and bring back industry to create high wage career oriented jobs to raise the standard of living of people in the region. Mr. Kozera has over 40 years of experience in the energy industry and is a regular newspaper and magazine columnist with four books and numerous published articles. He will be on hand to discuss updates within our area and what YOUR company needs to do to be prepared. Cocktails begin at 6:00pm followed by dinner at 6:30pm. The presentation will start approximately at 7:30pm. Tickets are $30.00 and include dinner and one drink ticket. A cash bar will also be available. THIS IS A RSVP EVENT. This event is exclusive to members and members guest ONLY and tickets MUST be reserved and purchased prior to the dinner. DEADLINE TO REGISTER IS FRIDAY, JANUARY 25, 2019. PLEASE CONTACT LISA KINDLER at lkindler@ovoga.org or 740.232.9219 to make your reservation. Come and network with other OVOGA members and hear the latest information about the industry in our area. For more information about Sleep Inn & Suites, please contact Jerry Delman at 740-782-1298. 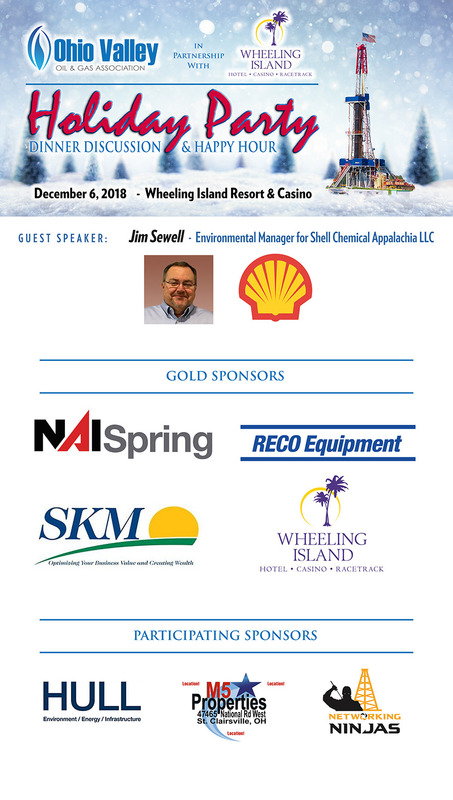 "Shell Chemical Appalachia - Cracker Plant Update"
Check-in, cocktails and networking will begin at 6:00pm followed by a buffet dinner. The presentation will begin approximately at 7:15pm. Corporate Sponsorships are available for this event. TWO FREE TICKETS WILL BE OFFERED TO EACH MEMBER. YOU MUST HAVE A RESERVATION TO ATTEND. ADDITIONAL GUEST TICKETS CAN BE PURCHASED FOR $35.00. Jason Sarakatsannis, General Manager, Utica Supply Hub, Williams Energy, will be on hand to speak about the current and future operations of the company in our area. Hear the latest information about the company and find out what this may mean for your business. This dinner will be held on Thursday, October 25, 2018 at Belmont Hills Country Club in St. Clairsville, Ohio from 6:00pm - 8:30pm. Tickets are $50.00 include dinner and two drink tickets. A cash bar will be available also. LIMITED SEATING AVAILABLE. THIS IS A RSVP EVENT. This event is exclusive to members and members guest. PLEASE CONTACT LISA KINDLER at lkindler@ovoga.org or 740.232.9219 to make your reservation. We will visit RECO Equipment in Morristown, Ohio and Lion Industries and MPR Supply Chain in Bellaire, Ohio. The tours will begin at 9am followed by a luncheon at Belmont Hills Country Club at Noon. Please contact Lisa Kindler to reserve your spot at lkindler@ovoga.org or call 740-232-9219 for more information. 2018 Red, White & Blue Member Appreciation BBQ - SAVE THE DATE! The 6th Annual RED, WHITE and BLUE Member Appreciation BBQ, welcomes Karen Matusic, Manager, Public and Government Affairs from XTO Energy to speak briefly about the company’s current and future activity in our area. Join OVOGA for a great evening of Summer Fun! Network in a casual atmosphere!! Food, Drinks, Games, Music and Prize Giveaways!! Plus enter the OVOGA Corn Hole Tournament !! Two tickets will be provided to each member. Additional tickets can be purchased for $20.00. Members are encouraged to invite their customers and industry friends for an evening of informal social networking and a great time!! Corporate Sponsorships are available for this event! Partner Sponsor: $1000 Your company will be mentioned in radio, press release spots and emails Name and logo on BBQ flyer, tickets, entrance banner and website Your literature displayed at the entrance table and Golf Outing 10 additional tickets Plus you will have the opportunity for a :60 sec radio spot at the BBQ! PLUS ALL NEW THIS YEAR!! 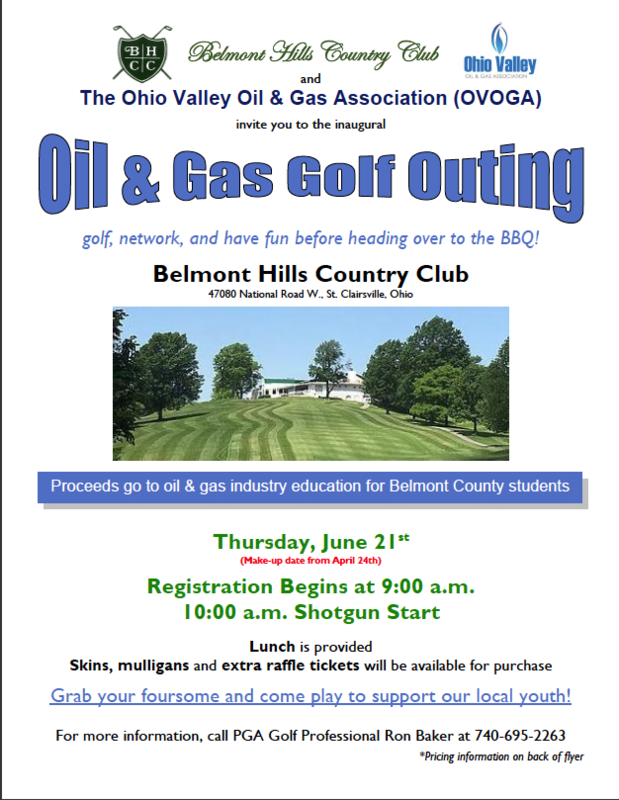 Join us for the inaugural OVOGA GOLF OUTING during the day on JUNE 21, 2018 at the Belmont Hills Country Club! Call 740.232.9219 or email lkindler@ovoga.org for more info. Join OVOGA and Steve Hedrick, President & CEO of MATRIC | Mid-Atlantic Technology, Research & Innovation Center for our May 2018 Dinner Discussion at Oglebay Resort on Thursday, May 31, 2018 from 6:00pm-8:30pm. Mr. Hedrick has more than 20 years of experience in the petrochemical industry, leading businesses, chemical manufacturing and health, safety, environment and quality (HSEQ). He will discuss the proposed Appalachian Storage and Trading Hub and the future of petrochemical and manufacturing companies in our area. Networking and cocktails begin at 6:00pm followed by a buffet dinner at 6:30 pm. The presentation to follow at approximately 7:30 pm. Tickets are $35.00 and include dinner. A cash bar will be available. 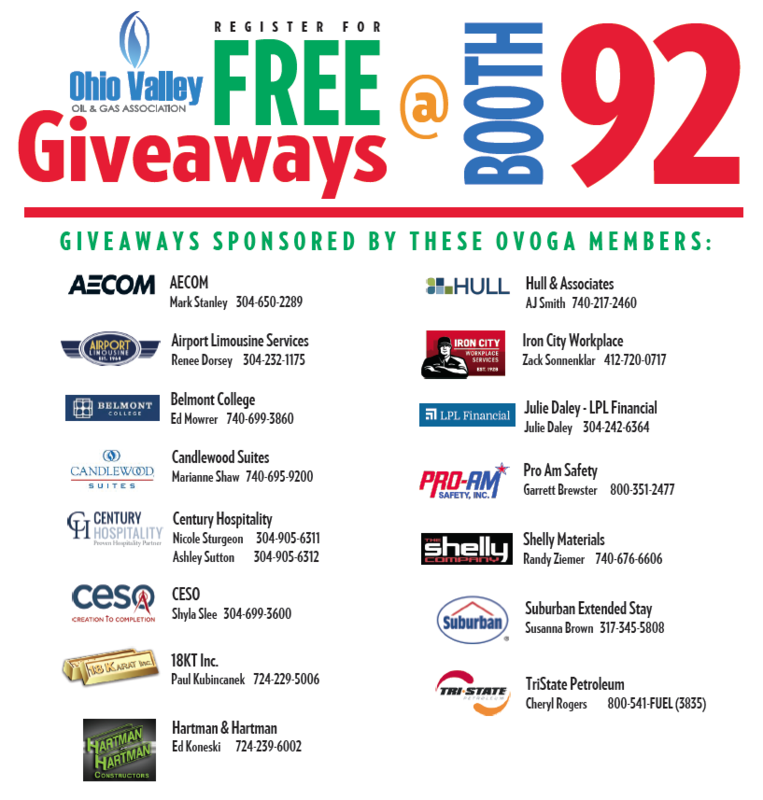 OVOGA members who are also Ohio Valley Regional Oil & Gas Expo exhibitors can assist us in the OVOGA for greater exposure. Please contact Lisa Kindler at lkindler@ovoga.org or 740.232.9219 for more information. ABSOLUTELY NO ONE WILL BE PERMITTED INSIDE WITHOUT A TICKET! Speakers: J.P. DUTTON, Belmont County Commissioner and PAT FORD, Executive Director, Business Development Corporation of the Northern Panhandle will be on hand to discuss economic development opportunities, industry updates and much more. "JobsOhio Strategy / PTT Update"
Join OVOGA and Matt Cybulski Director, Shale Energy & Petrochemicals JobsOhio for our February 2018 Dinner Discussion at Belmont Hills Country Club on Thursday, February 15, 2018 from 6:00pm-8:30pm. Matt will discuss JobsOhio’s strategy related to the shale industry and will also provide a brief update on the PTT cracker project. Dinner will follow the presentation. Thursday, November 30, 2017 at the Highland Events Center at the Highlands in Triadelphia, West Virginia attached to the Fairfield Inn & Suites in Triadelphia, West Virginia. The address and main entrance for the event is 350 Wharton Circle, Triadelphia, WV. Check-in, cocktails and networking will begin at 6:00pm followed by a buffet dinner. The presentation will begin approximately at 7:30. RESERVATIONS ARE REQUIRED. LIMITED SEATS AVAILABLE. Tickets are $35.00 and reservations ARE required. To place your reservation, please email Lisa Kindler at lkindler@ovoga.org. Additional tickets are available for $35.00. Deadline to register is November 16, 2017. SPONSORSHIPS AVAILABLE!!!! ONE OF OUR MOST POPULAR EVENTS!!! 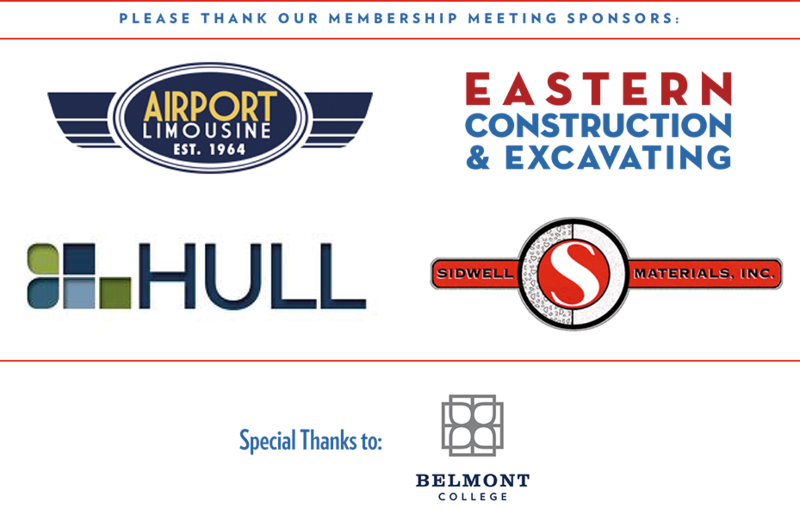 PLEASE THANK OUR EVENT SPONSORS! Brittany Carns is a public relations professional who has spent over a decade working in the natural gas industry. In her current role as Manager, Government Affairs and Community Relations for TransCanada Corporation she works to develop key relationships with public officials, community leaders, and other stakeholders within TransCanada's operational footprint. She holds an MPA from West Virginia University in Morgantown, WV and a B.S. from the University of Charleston in Charleston, WV. Alex Stroman oversees outreach in six states as Manager, Government Affairs and Community Relations for TransCanada Corporation. Prior to joining TransCanada, he served as Spokesman for the Republican National Committee and as Deputy Communications Director for the 58th Presidential Inaugural Committee for the inauguration of President Donald J. Trump and Vice President Mike Pence. Alex, a native of South Carolina, earned a B.A. from the University of South Carolina, where he was elected Student Body Vice President. An avid Gamecock sports fan, he resides in Washington, DC. Come and check out some of the economic development on the Ohio River, FROM THE RIVER!! Thursday, September 21, 2017. Boarding will begin at 12:45pm at the Follansbee, WV dock this year and the tour will conclude at 5:00pm. The Ohio River is an important asset to the valley in regard to moving materials, including coal, sand, gravel and pipe. The river plays an important role in the oil and gas industry in our area. Speaking onboard this year will be Larry Merry from the Belmont County Port Authority and Ed Looman of the Appalachian Partnership for Economic Growth. The Sewickley, a paddle-wheel boat built in the 1930’s and restored by Bob Harrison, owner of Bellaire Harbor Service, will board from the Bellaire Marina in Bellaire Ohio and travel down the Ohio River to Moundsville, West Virginia and back. View local companies and expanding businesses along the river front. Enjoy an afternoon of education and social networking and view the industrial expansion along the Ohio River. Tickets are $25.00 and includes beer, soft drinks and food. Seating is limited, you must purchase tickets prior to the event. Two tickets per company permitted due to limited space. RSVP and for payment information, contact Lisa Kindler at lkindler@ovoga.org or 740.232.9219. This event is open to members and members guest only. Two tickets will be sent to each member in the mail. Additional tickets can be purchased for $20.00. Gretchen Krueger, Community Affairs Liaison for the Rover Pipeline Project/Energy Transfer will discuss the state of the Rover Pipeline Route currently under development and its connections and benefits to our local community and contractors. "CONSOL Energy-- Future of Oil and Gas Industry in our Area"
Pete Nickel, Consol Energy, Operations Manager for Ohio and West Virginia will be on hand to discuss Consol’s current operations in our area and the future of the oil and gas industry in our local community. 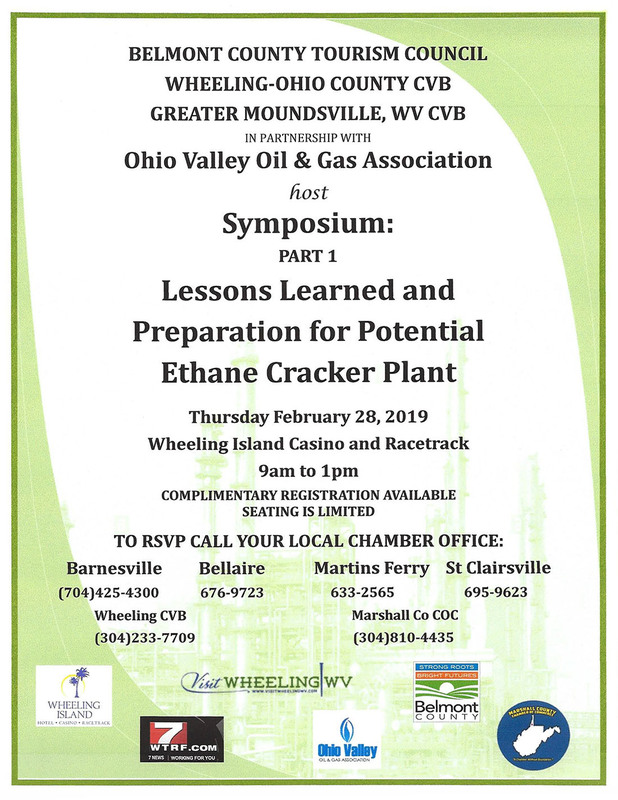 Jim Sewell, Environmental Manager for Shell Chemical Appalachian, will be on hand to discuss the Petrochemical Project in Monaca, Pennsylvania and how this plant will work in cooperation with other potential cracker plants, and may impact our local businesses. 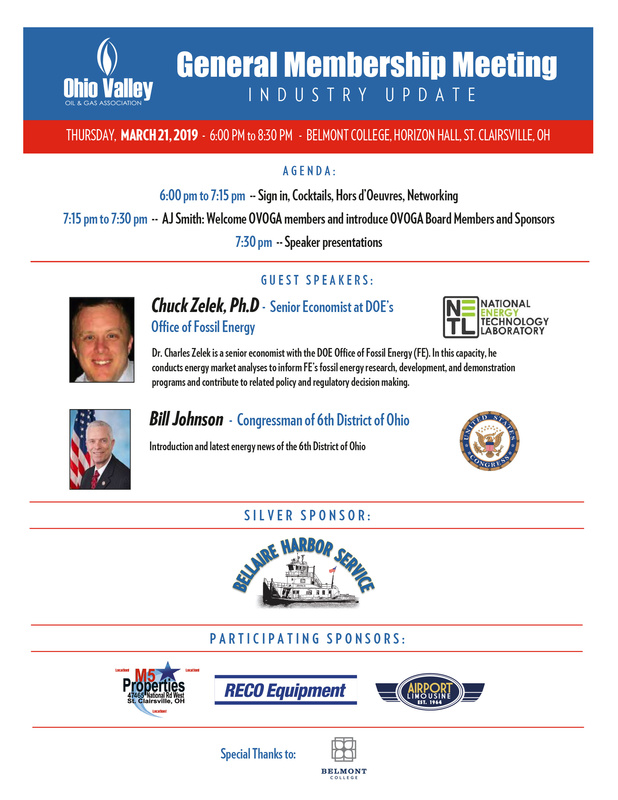 Ohio Valley Oil and Gas Association would like to invite you to the OVOGA 2017 General Membership Meeting on Thursday March 9, 2017 at Belmont College, Horizon Hall from 6:00 p.m. to 8:30 p.m.
Join OVOGA and RICE ENERGY for our February Dinner Discussion on Thursday, February 16, 2017 at Belmont Hills Country Club in St. Clairsville, Ohio. V.P. of Midstream Operations & Engineering, Justin Trettel, will be on hand to discuss and answer questions on the current status of the midstream industry in our area. Tickets are $30.00 and include dinner. A cash bar will be available. LIMITED SEATING AVAILABLE. THIS IS A RSVP EVENT. This event is exclusive to members and members guest. PLEASE CONTACT LISA KINDLER at lkindler@ovoga.org or 740-232-9219 to make your reservation. Tickets are $30.00 and include dinner. THIS IS A RSVP EVENT. This event is for members and members guest only and tickets must be purchased prior to the dinner. LIMITED NUMBER OF SEATS AVAILABLE.Please contact Lisa Kindler at lkindler@ovoga.org or 740.232.9219 to make your reservation. "2016 Holiday Happy Hour and Dinner Discussion featuring MarkWest"
OVOGA and CENTURY HOSPITALITY present our last event of the year! December Dinner Discussion with MarkWest! Dave Ledonne, VP of Operations Utica for MarkWest will discuss the current activities of MarkWest, future plans for the company and how your business can get involved. Thursday, December 1, 2016 at the Highland Events Center at the Highlands in Triadelphia, West Virginia attached to the Fairfield Inn & Suites in Triadelphia, West Virginia. The address and main entrance for the event is 350 Wharton Circle, Triadelphia, WV. Check-in, cocktails and networking will begin at 6:00pm followed by a buffet dinner. The presentation will begin approximately at 7:30. RESERVATIONS ARE REQUIRED. LIMITED SEATS AVAILABLE. Two FREE tickets are available for each member, BUT reservations ARE required. To place your reservation, please email Lisa Kindler at lkindler@ovoga.org. Additional tickets are available for $30.00. Deadline to register is November 18, 2016. 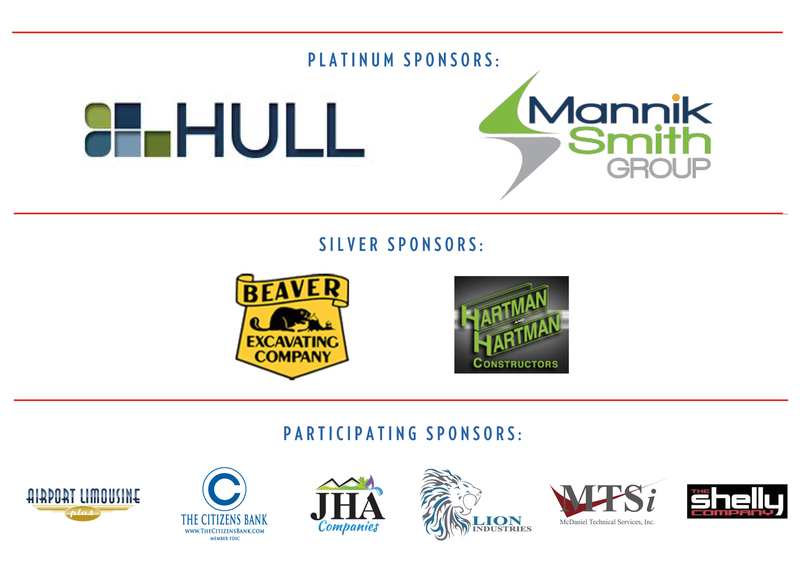 Thank you to our partner, CENTURY HOSPITALITY and our sponsors, CESO, JHA, MANNIK & SMITH GROUP, MCDANIEL TECHNICAL SERVICES and SP FINANCIAL. November 2016 Dinner Discussion Group: THIS EVENT HAS BEEN POSTPONED! "Gas Exports in our Area"
Join OVOGA for our November Dinner Discussion on Thursday, November 10, 2016 at Belmont Hills Country Club in St. Clairsville, Ohio. Fred Hutchison, Executive Director from LNG Allies, based in Washington DC, will be on hand to speak on the topic of gas exports in our area. What is the present status, what is to come in the future for the Ohio Valley, and how will this impact YOUR business? Hotel accommodations are also available at a discounted price for members. Please ask for more details. Join OVOGA for our October Dinner Discussion with Spectra Energy to discuss the NEXUS Pipeline Project on Thursday October 20, 2016 from 6:00pm to 9:00pm at Belmont Hills Country Club in St. Clairsville, Ohio. Anne Moore is Director of Business Development for Spectra Energy and is currently focused on the NEXUS project. The proposed project is approximately a 225-mile interstate natural gas transmission pipeline to deliver 1.5 billion cubic feet per day from recent points in eastern Ohio to existing systems in southeastern Michigan. THIS IS A RSVP EVENT. This event is exclusive to members and members guest. PLEASE CONTACT LISA KINDLER at lkindler@ovoga.org or 740-232-9219 to make your reservation. SAVE THE DATE: UPCOMING EVENTS! November Dinner Discussion: November 10, 2016 Fred Hutchinson Executive Director with LNG Allies to discuss gas exports in our area. "Pipeline Projects in Our Area"
TETRA TECH, a member of OVOGA, is a leading provider of consulting, engineering, program management, construction management and technical services worldwide. They will discuss their participation in regional natural gas and natural gas liquid pipeline projects currently in construction in our area. Wednesday, August 31, 2016. Boarding will begin at 12:45pm and the tour will conclude at 5:00pm. View local companies expanding businesses along the river front as well as the potential location of the multi-billion dollar petrochemical cracker complex. Tickets are $20.00 and includes beer, soft drinks and food. Seating is limited, you must purchase tickets prior to the event. Two tickets per company permitted due to limited space. RSVP and for payment information, contact Lisa Kindler at lkindler@ovoga.org or 740.232.9219. This event is open to members and members guest only. Join OVOGA for a tour of Eagle Manufacturing Company, Wednesday August 10, 2016 at 2pm in Wellsburg, West Virginia. Check in begins at 1:30pm. Eagle Manufacturing Company, a family owned business established in 1894, is a prime manufacturer of Safety Cans, Safety Cabinets, Poly Drums and Spill Containment, Material Handling and Cigarette Disposal Products. With over 750 products, they are the leading supplier of these products, offering a large selection of the industrial safety and material handling products for contractors, manufacturers, utilities, military, professional, government, printing, chemical, fabricators, transportation, textile mills, automotive, agricultural, medical, oil & gas, electrical and other industrial and commercial customers. Join us afterwards for Happy Hour at the Crooked Dock in Wellsburg for lite appetizers provided by OVOGA. Tickets are limited to two per company. Contact Lisa Kindler at lkindler@ovoga.org or call740.232.9219 to make your reservation. Deadline for reservations is Monday July 18th. "Cracker Plant Economics and the Ohio Valley"
JOE EDDY, PRESIDENT and CEO of EAGLE MANUFACTURING will be on hand to discuss what a cracker plant will mean for the plastic manufacturing and other spin-off industries in our area and what will be the local impact for our community. Two tickets will be sent to each member in the mail. Additional tickets can be purchased for $10.00. CORPORATE SPONSORSHIP opportunities are AVAILABLE! Your company will be mentioned in radio, press release spots and emails throughout the month of May and June, name and logo on BBQ flyer, tickets, entrance banner, on our website and additional tickets for their company. Custom made corn hole boards with YOUR Company's Logo will be featured during the tournament and will be awarded to the winning team. Also included:name and logo on BBQ flyer, tickets, entrance banner. Your logo will be displayed on the beverage cups at the BBQ! Plus your name and logo will also be featured on the BBQ flyer, tickets, entrance banner. Ohio Valley Oil and Gas Association would like to invite you to the OVOGA 2016 General Membership Meeting on Thursday March 10, 2016 at Belmont College, Horizon Hall from 6:00 p.m. to 9:00 p.m.
Paul Wojciechowski, Project Director of PTTGC America will be on hand to discuss the Petrochemical Project in Belmont County. HEAR FIRST HAND FROM THE COMPANY RESPONSIBLE FOR THE PROJECT, the latest news about the potential cracker plant to be built right here in our area. What will this project consume? What will it produce? What is the present schedule? ABSOLUTELY NO ONE WILL BE PERMITTED INSIDE WITHOUT BEING PRE-REGISTERED! NO EXCEPTIONS. DEADLINE TO PRE-REGISTER IS MARCH 7, 2016 by 4:00 pm EST. CONTACT LISA KINDLER AT 740.232.9219 or lkindler@ovoga.org TO PRE-REGISTER. "Oil and Gas Industry Insight into 2016"
Dinner Discussion with OOGEEP, Belmont Hills County Club. A recap of the 2015 Oil and Gas Industry and insight into 2016. What should we expect in the oil and gas industry in the coming new year in our area? MORE DETAILS TO COME! Tickets are $30.00 and include dinner. A cash bar is available. THIS IS A RSVP EVENT. This event is for members and members guest only and tickets must be purchased prior to the dinner. Please contact Lisa kindler at lkindler@ovoga.org or 740.232.9219 to make your reservation. "State of the 711-mile Rover Pipeline Route"
Join OVOGA and ENERGY TRANSFER for the November Dinner Discussion November 5, 2015 at Belmont Hills Country Club from 6pm to 9pm. Gretchen Krueger, Community Affairs Liaison for the Rover Pipeline Project/Energy Transfer will discuss the state of the 711-mile Rover Pipeline Route currently under development and its connections and benefits to our local community and contractors. Join OVOGA for our first Sporting Clay Shoot on Tuesday, October 27, 2015 at Hunting Hills Sporting Clay in Dilliner, Pa. Registration and target practice will be from 2pm-3pm and the main event shotgun start is scheduled for 3pm. Steak Dinner, raffle drawings and awards will follow at 5pm. 100 targets of sporting clay w/ golf cart, steak dinner, cold beer and soda, and door prizes!! All shooters must provide their own equipment including, shotgun, eye and ear protection and shells. For more information or to register for this event, please contact Lisa Kindler at lkindler@ovoga.org or call 740-232-9219. We would like to offer our members a marketing opportunity by displaying their literature at our booth. We are asking for 50-75 pieces of your brochures/printed information (maximum size: 4 x 9). 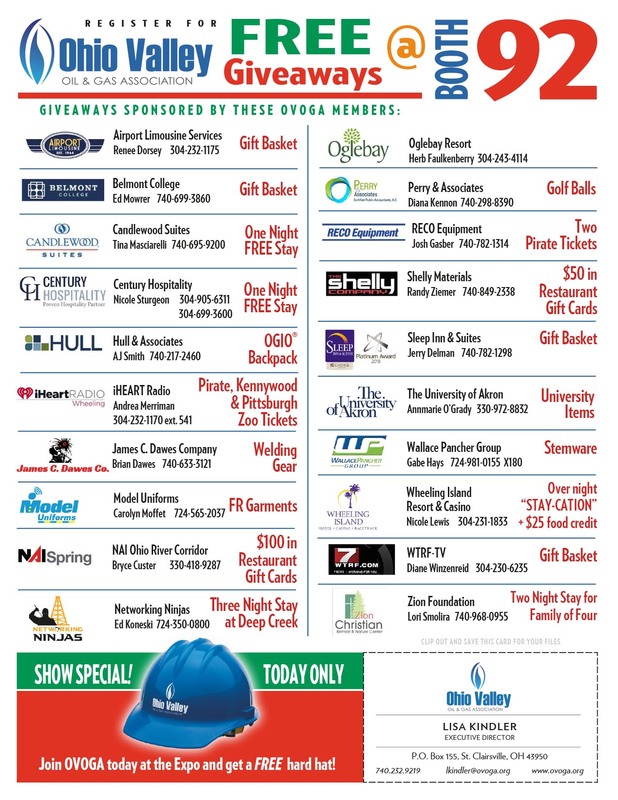 Donate items for our hourly raffle at the Expo:. Gift cards, sporting event tickets, electronics, or anything you may want to donate is appreciated. All items donated will appear with your company name and phone number on a hand out sheet passed out to all that attend. 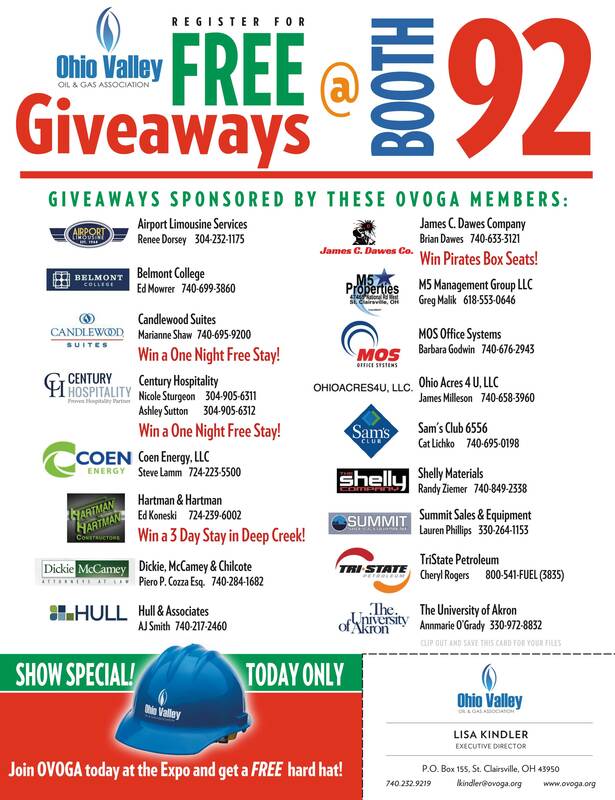 You may also volunteer to work a shift at the Expo on behalf of OVOGA and YOUR business. Deadline for donations as well as a volunteer time slot is Monday September 28 2015. "Well Site Construction, Preparation and Safety"
What can go wrong on the well pad and how can it be avoided? What are the steps and procedures to construct a safe well site? Can your company be involved in any way? Coach Rikeman, VP of Operations and Mike Lauderbaugh, VP of Environmental Health & Safety at Rice Energy will discuss well site construction, preparation and safety during our September Dinner Discussion, Thursday September 24, 2015 at Belmont Hills Country Club from 6:00pm to 9:00pm. Tickets are $30.00 and include dinner. THIS IS A RSVP EVENT. This event is for members and members guest only and tickets must be purchased prior to the dinner. Please contact Lisa kindler at lkindler@ovoga.org or 740.232.9219 to make your reservation. OVOGA invites you to a River Boat Tour sponsored by Bellaire Harbor Service and Midwest Industrial Supply. Thursday, August 13, 2015. Boarding will begin at 12:45pm and the tour will conclude at 5:00pm. The Sewickley, a paddle-wheel boat built in the 1930's and restored by Bob Harrison, owner of Bellaire Harbor Service, will board from the Bellaire Marina in Bellaire Ohio and travel down the Ohio River to Moundsville, West Virginia and back. Tickets are $20.00 and includes beer and soft drinks. Seating is limited, you must purchase tickets prior to the event. RSVP by contacting 740.232.9219 or email lkindler@ovoga.org for more info and how to attend. "Is the Shale Revolution Over?" Call 740.232.9219 or email lkindler@ovoga.org for more info and how to attend. The world's leading event focused on unconventional resource development in the vast Marcellus and Utica shale plays, as well as emerging plays throughout the Appalachian region. This year's event will bring together more than 3,100 oil and gas professionals, 20+ executive-level speakers and over 320 exhibitors for two days of in-depth discussions on how to continue to improve operational efficiencies. Visit DUGEast.com to learn more about why you can't afford to miss this essential industry gathering. and save $200 on your registration. *Discount valid for Conference & Exhibition passes only. Not valid for exhibit-hall-only passes. New registrations only. Not valid for refunds. OVOGA periodiacally sponsors Round Table Luncheons throughout the Ohio Valley at varoius restaurants. These are casual events. Space is limited, so please reserve your seat early.,. We will announce locations here and via email to our member list. * All luncheons begin at noon and are Dutch-treat. Please RSVP to Lisa at 740.232.9219 or lkindler@ovoga.org. Each OVOGA member organization will receive two complimentary tickets in the mail. Additional admissions for your guests may be purchased for $20 each. Download additional guest ticket form here. The Ohio Valley Oil and Gas Association present an exciting evening featuring the "NEWEST TREND of NETWORKING". OVOGA INDUSTRY MATCHUP /SPEED NETWORKING EVENT. Companies involved in the Oil and Gas Industry can come together and initiate relationships by connecting in an exciting, high-impact, STRUCTURED environment, where you are guaranteed to make new connections with like-minded contacts. By participating in this event, we can provide you with organized, credible "mini-interviews" from various types of companies in the Industry. Upon registration, you pre-select the types of businesses you would like to meet, and the day of the event, you receive a schedule of which companies and their background that you will be connecting with. Each "mini business meeting" will last an average of 5-8 minutes. This is just enough time to discuss what services or products their business provides and to discuss any business needs or referrals, and possibly set up any future meetings. How you can market your company to the Oil and Gas Industry and stay on top of what's going on. Learn how you can increase your company's exposure in the oil and gas industry. Tickets are $30.00 per person and include dinner. Cash bar will be available. Seating is limited. Please contact Lisa at 740.232.9219 or email lkindler@ovoga.org to register. Join us for our next Dinner Discussion Group, The Exploration and Production of Oil and Gas in our area/Local and Statewide Activity Updates! 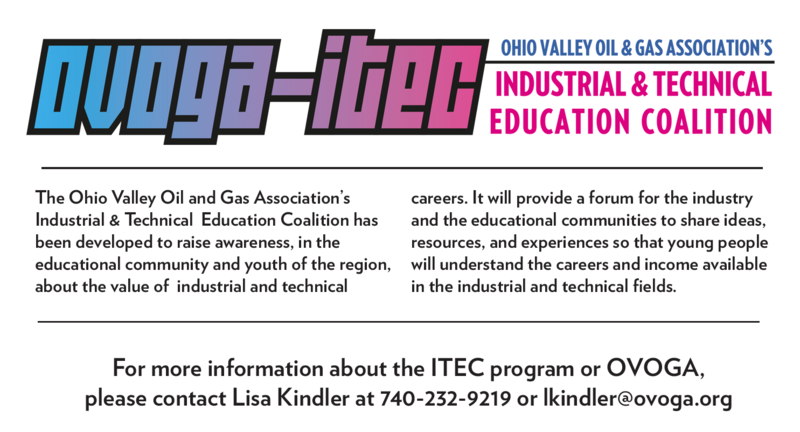 Rhoda Reda the Executive Director of Ohio Oil and Gas Energy Education Program and the Ohio Oil and Gas Energy Education Foundation will be presenting an overview of how oil and gas is explored, drilled and produced in our area as well as the economic and work force development. "What companies are in our area? What businesses are being affected? What is to come in the near future? Join us and find out the answers to these questions and more. Tickets are $30.00 per person and include dinner. Cash bar will be available. Biggie 100.5 will Live Broadcast and spin the wheel for prizes. accommodation for two at Ogelbay Resort! at the registration table! Winning team receives OVOGA custom made corn hole sets! It is not too late to invite your Oil and Gas Industry Guests! Call 740.232.9219 or email lkindler@ovoga.org for more info and additional tickets for your guests. Call 740.232.9219 or email lkindler@ovoga.org for availability.